I have a special relationship with my Crock-Pot. I cook a dinner or two in it every week, and it’s probably my favorite gadget in the entire kitchen. I’m also a giant nerd (naturally) and a fan of the easy-to-use Belkin WeMo line of smart home products, so when I saw Belkin’s Crock-Pot Smart Slow Cooker with WeMo in a booth at CES, I squealed like it was being demonstrated by a shirtless Ryan Gosling. I was so excited to get it and use it—I fully expected to love this nerdy Crock-Pot I could control from my iPhone. But now that it's in my home, this cooker is kind of a letdown. It does what it does just fine. It just doesn’t do as much as my simple slow cooker that costs less than half as much. The 6-quart WeMo Crock-Pot has built-in Wi-Fi. Once you get it set up on your network, you can turn it on and off, set a timer, and adjust the temperature from the WeMo app for Android, iOS, and Kindle. The Wi-Fi indicator lights up, but you can't tell how much time is left—or change the program—without the app. The app is designed to control the whole range of WeMo products. Which means it’s not cooking centric—you won’t find recipes, for example, or a side timer to remind you to get a pot of rice boiling to serve with the stew that’ll be ready in an hour. What it does show you is how long your dish has been cooking, how long is left, and the Crock-Pot’s current setting. I like cooking gadgets to have apps about cooking, but the app works just fine. If the Crock-Pot loses its network connection—which mine did a few times—it keeps cooking according to the directions you gave it last. When it switches to Warm, you get a notification, which is a nice touch. Weirdly, you have to use the app to set the Crock-Pot’s timer. You can walk up to the Crock-Pot and turn it on with a single button that toggles between High, Low, Warm, and off, but that just turns it on, and you need to then go find your app to set the off time. So if your phone is upstairs charging and your kids are using the tablet to play a game, you might be bummed you can’t just push a few buttons on the Crock-Pot itself to finish programming it. My $50 slow cooker has two killer features that this smart Crock-Pot lacks. First, its lid clamps on securely with these two huge clamps. You can clamp that sucker on and drive 5 quarts of chili to your friend’s Super Bowl party without risking spillage in the trunk of your car. I thought I would never use this feature, but I do. By the end of the test, I missed the extra features on my dumb slow cooker—which is also $70 less than Belkin's. My cooker also included a temperature probe, so when I cook a chicken or a big roast, I can program the internal temperature I want it to reach. When it gets there the Crock-Pot switches to Warm and beeps really loudly. That does not ping my cell phone, which I admit would be nice. But I could always experiment with sensors that respond to sound for a geeky workaround. 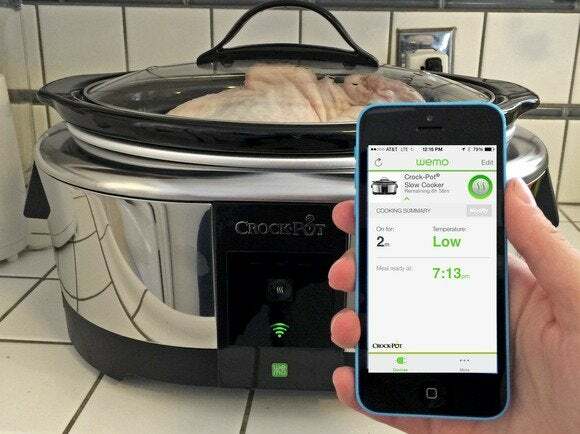 The promise of a connected Crock-Pot is that you can control it from anywhere. But the whole point of a Crock-Pot is that you put some stuff in, you set a timer, and you leave it alone. When the timer gets to zero, the Crock-Pot switches from its cooking temperature (most cookers offer just Low and High) to Warm, to keep you food warm until you eat it. The app is the only way to program the WeMo cooker. There's little to no need to turn your Crock-Pot on remotely—in fact it would be unsafe to leave uncooked meat sitting out in a Crock-Pot that’s turned off. For that reason, the WeMo app doesn’t let you program a start time. Once the food is in the slow cooker, you usually need to start cooking immediately. And there’s very little need to turn off your Crock-Pot remotely—again, you’d just have food sitting there. If you’re on your way home, it’s better to have it on Warm, or Low, or High, and you can turn it off when you’re right next to it, ready to eat. I guess there might be a time where you’d want to remotely adjust the Crock-Pot. Maybe you have a stew on Low since you’ll be away all day, but it turns out your family is coming home several hours earlier, so you could adjust it to high so they can eat dinner without you. Or you put some chili on High thinking you’ll be back in a couple hours, but you get detained, so you want to turn it to Low. If the WeMo cooker loses its network connection, your food will keep cooking. You just won't be able to adjust the cooker until it's back online. But that second example doesn’t even make a ton of sense, because if you’re still away when the High timer runs out, it’ll just switch to Warm and stay there for as long as you need it to. Turning a Crock-Pot from Low to Warm might make more sense, but Low is still pretty low and it’s hard to think of a dish that would be ruined by sitting on Low until the timer runs out—a timer that you set, I add, presumably according to some recipe. Now, some recipes do call for a temperature change: cook on High for two hours and switch to Low, for example, or turn it up to High for the last 30 minutes to thicken a sauce (often with the lid off, which can’t be done remotely). If you make a lot of those, this could be just what you need. This doesn’t feel like a premium Crock Pot that has Wi-Fi as one of its many advanced features. This is a very basic Crock Pot with Wi-Fi added to replace a few programming buttons and an onscreen LCD. I wanted to love it, but this slow cooker left me cold. The WeMo slow cooker needs improvement as a Crock-Pot, because its smart features don't add enough value to justify the extra cost. Can't program or adjust timer from the Crock-Pot itself.